Fieldstone is pure Hudson Valley. A rare find of 130 acres of forests & fields with 1 mile long frontage, in the town of Gallatin, southern Columbia county. An 18th century farm house sits on the edge of a valley, overlooking a pond, a 25x50 gunite pool, and a compound of early 19th century barns and more. 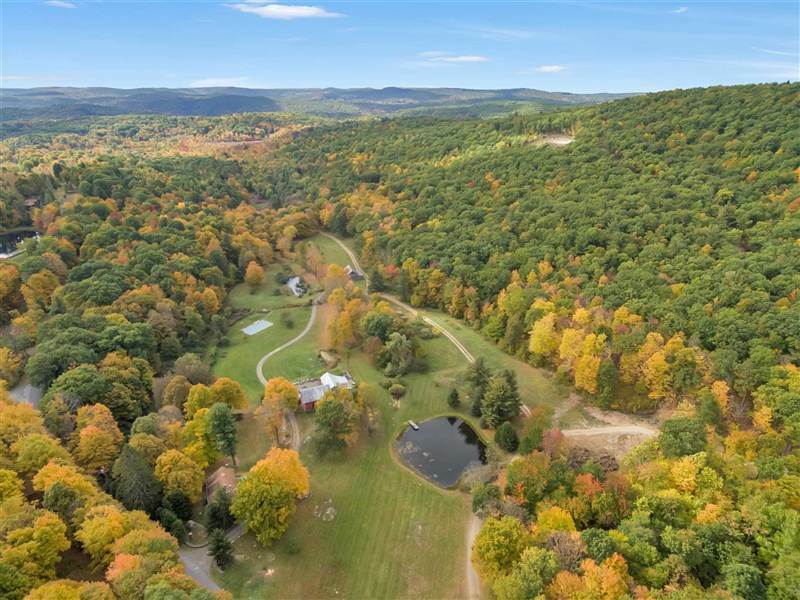 A half a mile driveway following the contours of the hills, forested with a variety of hardwoods, leads to a 950 foot high rock ledge plateau, with breathtaking, panoramic views of the Berkshires, Shekomeko valley, and Stissing Mt. The open hilltop is suitable for a world class home. NO RESTRICTIONS OR EASEMENTS. A naturalist's and sportsman's paradise, completely private with abundant wildlife, 2 ponds, mowed farm roads, hiking trails, a creek, orchards & pastures which can be used for horses, farming/forestry. An ideal location. This property must be seen. Located along the TSP near Rhinebeck and Hudson, close to all that Hudson Valley has to offer. Only 2 hours from NYC.